It can be tough to get dinner on the table every night whether you’re single, a couple, or part of a busy family where both parents work outside the home with kids in multiple activities. Some people seem to have it all figured out and others still struggle. Recently, I asked the members of my local online moms group for advice on what works for them in terms of making regular meals. I got some excellent responses that I wanted to share here. Follow a Simple Meal Structure (aka Theme Nights). Many people answered that they like to have theme nights for each day of the week. For example Monday is pasta, Tacos on Tuesdays, Wednesday is soup night, Thursday is fish and vegetables and Fridays are for homemade pizza. Having a theme can be a simple way to figure out what to eat every week. To avoid boredom you can change up the ingredients every week. Personally I have never made the same pizza twice because I use up what’s in the fridge for the toppings. You can make vegetarian tacos one week and chicken tacos the next week. Some people like to cook a bunch of food on the weekend and either freeze it for later or use it up during the week for various meals. “When I have my act together the things that work for me are: cooking meals in advance/batch cooking and freezing and doing vegetable prep in advance, so that you can just throw it all into a pan for a quick dish,” said Carrie B.
Batch cooking can be a saviour for many people because the food is already done for you when you get home from work or an activity. For example if I diced and roasted a few sweet potatoes on Sunday, I would eat those with some eggs for breakfast on Monday, in a taco on Tuesday and on a pizza (yes pizza!) on Friday. The downside of batch cooking is that you have to know what to eat it with the food you cooked. Some people might look into the fridge and see a bunch of roasted veggies in separate containers and not know what to do with it. It really depends on your personality and how you like to eat. You know by now that meal planning and prepping is what I love to do most. There are days when I like to wing it of course, but meal planning and prepping makes it easier to know what you’re having for dinner. Sometimes in the morning I’ll think “What’s for dinner tonight?” and then I’ll remember that I have a plan and relief hits me that all I have to do is put the meal together and not think about what I’m going to cook. Others like the consistency of meal planning. “I usually do some prep on Sunday,” said Paula M. “A soup (and portion some into small mason jars), a breakfast hash (this week ground turkey, sweet potato, zucchini, carrot, apple) which is used for breakfasts or a last minute lunch. I prep some veggies for lunches and quick meal prep during the week and generally try to keep meals simple—quality protein and lots of veggies. A curry or chili prepped in advance if I am really feeling it. Keeping the meal plan out for everyone to see works for a lot of people. Keeping meals simple and trying not to over complicate things was a theme throughout many of the responses. People like to save the more elaborate meals for the weekend when there is more time. “Keep it simple! 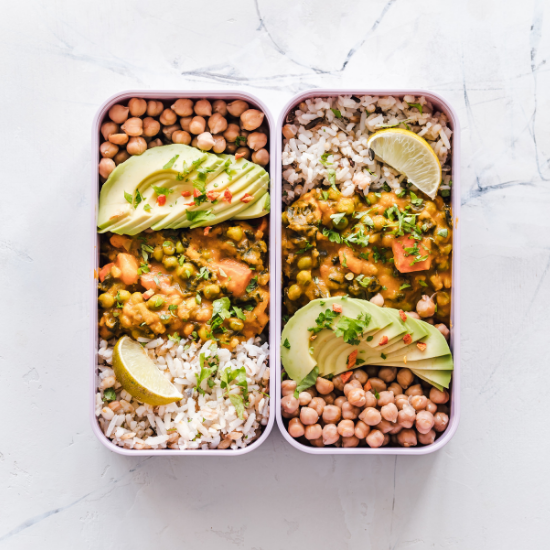 Protein, veg, starch,” says Lindsay N. “Make extra one night so you have leftovers the next night (eat as is or transform into stir fry or a sandwich). Breakfast for dinner once a week. When prepping, do extra. Christine C. says not to over-complicate meals. “The protein bakes while veggies boil or steam, boil some noodles/potatoes/rice and chop a couple of fruits up. You can do this with five-minute prep and very healthy. If you have a family, they should be helping too if they can. Get the kids to chop vegetables (teach them to use a small paring knife). Cooking with your partner can be a nice date while you listen to music and everyone should help with the dishes. It’s a rule now that my kids have to clear their plates from the table and put them in the dishwasher. It doesn’t matter if they do it the ‘wrong way’–you’re teaching them responsibility and you can just fix it the way you like later anyway. :). I thought these were great ideas and I hope they help you figure out what to do for dinners next week.